Have you ever heard the expression "It takes money to make money"? I feel like some version of that could apply to streamlining one's closet: It takes acquiring some key pieces to make the most of everything else in a girl's wardrobe. Most of my fall shopping has revolved around replacing staples that don't fit anymore (like my classic khaki trench) and updating others. Here's what I'm adding to the mix to optimize my closet, this season and beyond. 1. As evidenced by yesterday's outfit post (and most of this past summer's ensembles, really), I'm hooked on Breton stripes. I prefer when they're in cotton and loose-fitting like this Topshop long sleeve stripe top. 2. Black ballet flats are essential to every girl's closet; for a trendier variation, I've been favoring these almond-toed tassel slippers from Aldo. The leather is so soft they don't require any breaking in, the footbed is padded, and the flexible rubber outsole makes them great for walking and commuting. No wonder I've been wearing them every day since I bought them! While I can't find the exact same pair online anymore, the Aldo 'Kraut' flats ($70) are very similar. 3. These days, I prefer my cardigans looser and longer, with a slight borrowed-from-the-boys vibe—perfect for throwing over tees, skinny jeans, and ankle boots. The burnt orange hue of this J. Crew V-neck cardigan ($106) goes with many neutral- and basics-laden looks, and the colour feels so sophisticated. 4. Pearl studs in a variety of sizes and colours (white, pink, and black) are on heavy rotation in my looks these days. 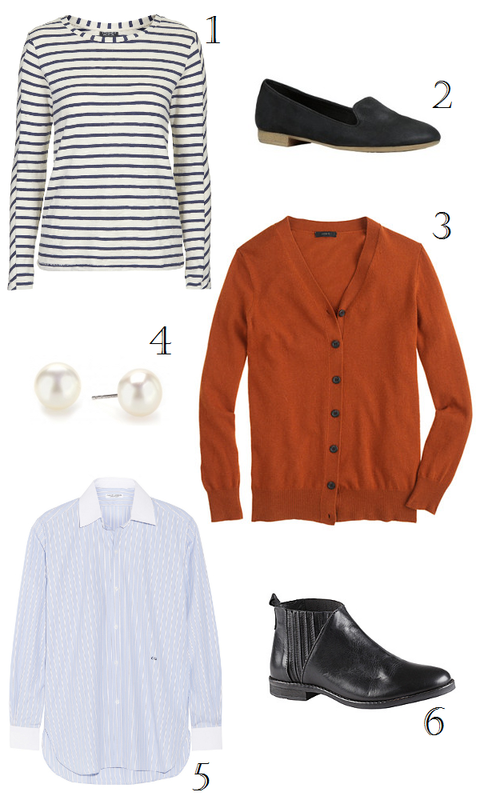 The ones that started it all are the Maison Birks large freshwater pearl stud earrings ($250), which seem to go with everything. 5. Some girls can borrow their boyfriends' button-down shirts and look adorable wearing them with skinny denim and a big clutch. Unfortunately, the size difference between my fiancé and me makes it look like I'm wearing a nightshirt when I try. That's why I love, love, love this Charlotte Gainsbourg x Current Elliott shirt ($290). It mimics the feel and look of an oversize menswear shirt, but the details hit my petite frame in exactly the right spots to still highlight my shape. 6. Last fall, I bought two pairs of heeled ankle boots and practically lived in them during the cold season. But I could definitely use a pair of flat ankle boots like the Aldo 'Legaria' ($130) in the mix. Thanks, Chiara! These pieces have so much mileage in them they are worth the purchase, but yeah, my credit card has been hurting a little because of fall shopping and wedding expenses haha. Lisa, I love hearing about how you are maintaining/building your basic wardrobe. I've done the same thing the past three years and it has really changed how I decide to "indulge." Far fewer items, but all of them better quality. It's an inspiration to see how you do it too! I could probably learn a lot from you! I won't even pretend to call this a move towards minimalism; it's more like "I don't want to feel overwhelmed with stuff."